Gilbert Mair (1843–1923) was born at Whāngārei. As a young man working in his father's Northland kauri gum business he came into close contact with Māori, and learned the Māori language. He later became a surveyor, and a clerk and interpreter at the Tauranga Resident Magistrate's Court. 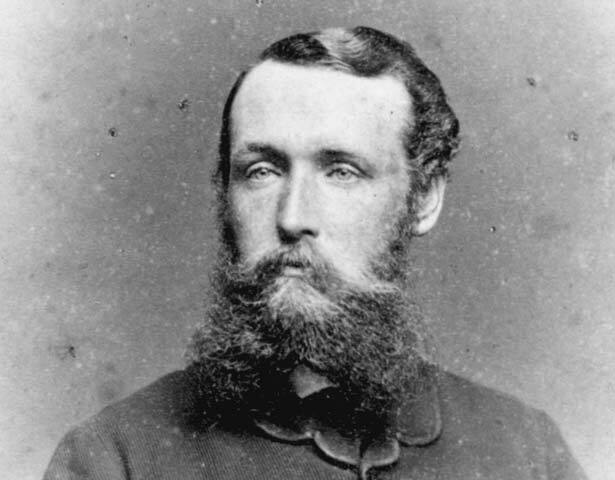 When fighting broke out at Tauranga in 1867 Mair volunteered. He served with distinction and achieved the rank of lieutenant. In 1869 he took a leading role in campaigns against Te Kooti, and was promoted to captain. Later he commanded an irregular contingent of loyalist Māori which became known as the "Arawa flying column". Mair affectionately referred to the flying column as his "forty thieves". During his military career Mair displayed initiative, skill and reckless courage. He was particularly skilled in guerrilla tactics. After the wars Mair became a Crown land purchase agent in the central North Island. He acquired vast tracts of land – including the Kāingaroa Plains. Part of his success as a purchase agent was due to the close relationship he had forged with Te Arawa during the wars. He later became critical of the government's methods of acquiring Māori land. Mair subsequently served as a parliamentary interpreter and Government Agent at Tauranga. He was at different times president of the Ikaroa Māori Land Board, a Resident Magistrate and Superintendent under the Māori Councils Act 1900. As Superintendent he was required to enforce a range of regulations devised by the Te Arawa Māori Council. Until his death in 1923 Mair was a Rotorua landmark - guiding and interpreting, and hosting many notable visitors to the Hot Lakes District. He has been described as a "not always ethical collector of Maori artifacts", but despite this he maintained a close relationship with Te Arawa. Mair is one of the few Europeans to be buried in the Te Arawa cemetery at Ōhinemutu. We have 37 biographies, 16 articles, 12 comments related to Gilbert Mair. I have learned a lot from this page as thought the only other wife Gilbert had was a 16 year old Princess Kahu Kiwi Parata Manawhiki, who was gifted to him, by her tribe, Ngati Haua - this information appeared in an article in the Evening Post (Wellington) 16/12/1967) from an interview with their daughter Violet Patterson. I have a copy of Gilbert's Will and Violet and his daughter Hon Kitty Vane (from the marriage to Kate Sperrey) are mentioned. Now want to know more. I am the great great grandson of Gilbert Mair. I have traced the Mair geneology back as far to my 5th great grand father in Scotland. I also know the Tartens worn by the family and have contacted the Mair clan leader here in Australia (none in NZ), he lives in South Australia. I also now own replicas of Gilbert Mairs 2 medals the NZ cross for galantry and the colonial medal. My cousin Te Atapo Brown has spelt out our family tree links. Needless to say that my first cousin looks just like his great grand father Whareahuru who looks just like his father Gilbert Mair. Europeans may be wondering why the Maaori link? Well back in those days Maaori women were "gifted" to Europeans for various reasons. Gilbert Mair was the equal of a Chief in the Te Arawa tribe, this is where my great great grand mother Keita comes into the frey. The rest is history! My husband is descended from Marianne. Does anyone have a photo of her? There are photos of all her siblings but none of her. I would also love to borrow the book written by Laura "Annals of a NZ Family"
Im a decendant from gilbert mair thru his son whareahuru also whos mother was keita hemi Kupa...whareahuru married Purewa Te Tahiwi who was from Otaki they had a son Heta Kareanui Gilbert who is my great grand father. I am a Mair descendant through one of Gilbert's sisters Marianne. I have done some research on the family history and have sourced a couple of pages titled "A few facts relative to the Mair family" written by Gilbert Mair from the Alexander Turnbull library. This notes that the original family lived at Deveron, Banffshire, Scotland for about 400 years prior to 1800. I am happy for you to forward my email address to Chris as I can provide him some family tree info which may assist him. I am a descendant of marianne mair (fraser) i am interested in any family tree info you might be able to provide.